I was only on Saturday at Zinal. The weather, the slopes, ... it was simply perfect. Thanks for the organisation and I'll hope seeing some nice pics. See you next year ??? I was in Valais for 3 days only this weekend, managed to be in Zinal this saturday, I loved it. The mountain was filled with carvers riding HARD. It was actually my second day on plates ever, on a brand new Goltes Pro Race 170 after 8 years on softies. I was kind of blown away by the skills of some riders, but after a few runs I actually managed to lay some serious trenches on the superb groomed blacks as well. My skiing friends, always bullying me about riding boards, were intimidated and humiliated Thanks to all the riders for that, had some good fun. After 14:00 I did some hiking on softies to rip some powder, which made it a perfect day. Did a tour round 4 vallees the day after, that was quite a shocker, crowded slopes with inexperienced people compared to the EC'ers and parapentes in Zinal. I hope to see some nice pictures! Back to the chalet after this amazing Session! I really loved it! Thank you to everyone for all the great moments we had together. Year after year, there are real friendships that have been established with the people who come regularly. From the new participants I heard many positive things about the slopes, the ambiance, the organization, the Swoard demo boards, etc. and about coming back next year. However we are victim of the success of the event: the main hall in the village becomes too small. We will find solutions for the future. Since first edition, the organization and activities have improved a lot. Special thanks to Samanta who made an impressive work (I know what I'm talking about). Our goal is to still improve the event and do the best we can do. I hope that you appreciate our efforts. Many thanks to the staff: Balthazar, Romain, Franck, Olivier, the instructors I mention below and all the other persons who also helped us. 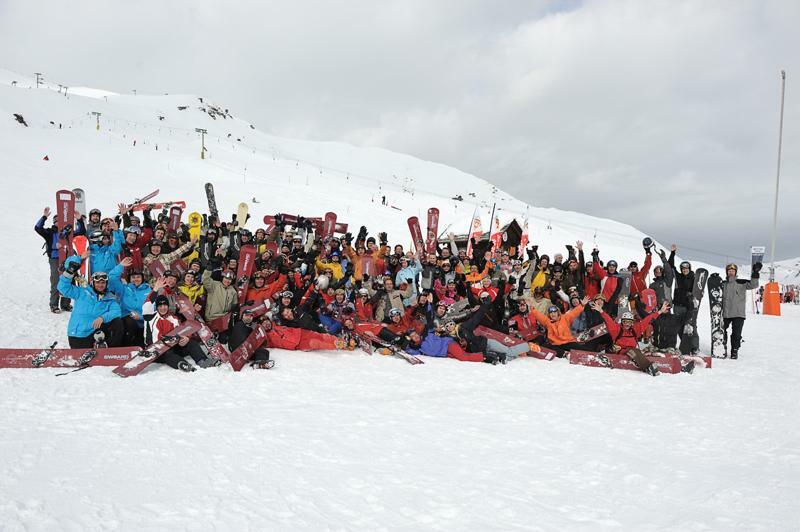 About 220 participants : it has been probably the biggest event in the world about alpine snowboarding! Some of the best snow conditions for carving and extremecarving in the season so far (along to the local riders including me). Wonderful Saturday weather. During the other days we got sun and good visibility despite the clouds and the snow falling in west Switzerland. A black slope (Le Col) reserved in the morning for the participants only... which was destroyed in 1-2 hours! Fortunately there were 2-3 other slopes (including the famous Barthélémy) that we could extremecarve too. Excellent spirit and many cool persons from about 15 countries. Top 5 is: France, Switzerland, Italy, Germany and Russia! The riders level is still higher and higher! One of the goals behind this event created in 2004 is reached. I remember the first session when a ski instructor complained about the riders level. 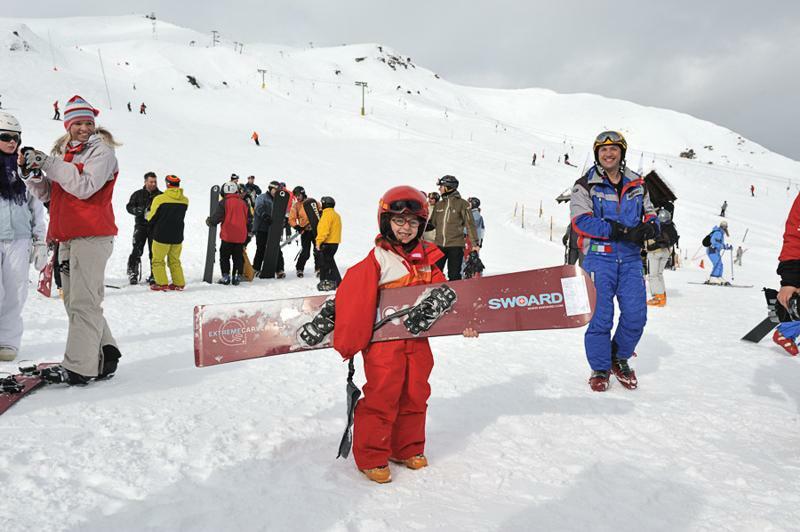 This year another ski instructor came to me and asked me if he could try a Swoard demo. We are happy to see many riders using now the rotation, push-pull and extremecarving techniques. During this last session our instructors (Arnaud, Anthony, Alex and Sylvain) have done a great job! Special thanks to them. Special thanks to Vahur, the official photographer! He will make his wonderful pictures available soon. We will also post a Best Of in this Web site. For sure there will be a 7th edition! The date will be given as soon as possible before next autumn. Download the full resolution picture! See the link above. It was my fifth participation to ECS and I think it was the most beautiful. Thank you to the skiers and snowboarders who went to Zinal and cannot go on the slopes when we carved. Like every year I've to say the same: this was the best ecs... simpy wonderful again! as usual,my eyes was closed! Indeed - as it has been said already: IT WAS GREAT!!! Good to see so many friends friends - some new, some that I had met in Zinal last year. Good to see how Extreme Carving should be done (I will get there, that backside turn still escapes me, but I am working on it). Thank you to all that worked hard for such a flawlessly great organization of the event. Please tell me how you manage to get that good weather for all the ECS's. It was raining/snowing hard elsewhere on the other side of the Alps, but we were in pretty good weather all the time. As I mentioned directly to P&J: I think that the idea of the nametags like last year was a good one: it avoids the embarrassment of not remembering the name/nickname of the person that we met just moments before. (putting the nickname on the swoard like I do with my big "AZ" also helps in that respect). Thank you again to all for making ECS-09 such a memorable event, to be surpassed only by the next ECS's in the years to come. Alex wrote: Like every year I've to say the same: this was the best ecs... simply wonderful again! The best gift to give to the organization team is seeing this thread and all the people enjoying this week-end. - Saturday non stop working from 5.30 am to 1.30 am !!! - Balthazar stayed 27 hours into the cold and rode 0 min on the week-end. Carrying HALF TON Material with only 7 person was a kind of challenge !!! Arnaud - Gaga - Franck - Vahur - Sylvain- Alessandro - Anthony- Olivier and Balthazar our official helpers. And all the people proposing to us spontaneously their help for carrying this HALF TON MATERIAL !!! and finally a big thank you to all the participants bringing their good humor to the ECS VI. I'd also like to say thank you to all who made this meeting possible! We had a great time on the slope and together with the ec-community! As AZ already said, I found the nametags from last year quite practical. I'd be pleased to have them next year again. I just wondered where all 220 participants have been after 2pm on Saturday/Sunday and after midday on Monday. Well, there isn't much left to say ... and yet still so much! Patrice, Jacques, Samantha, for spending so much of your free time to give us the weekend of our life. The instructors, especially Arnaud, for having the patience to learn us how to carve. The people behind the stand for always serving us with a smile and friendly word. All the participants who make the event for what it is by just being there.